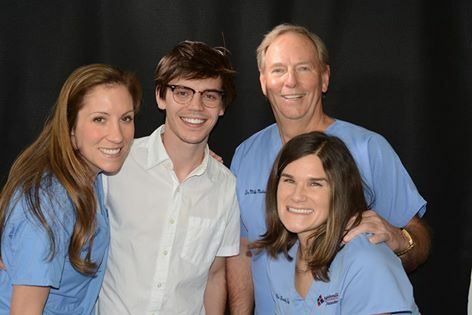 We couldn’t be more proud or more impressed by MacKenzie Bourg. Last night American Idol devotees crowned Trent Harmon their fifteenth–and final–winner of the reality-style game show. This season meant a great deal to us, as we watched one of our own, MacKenzie Bourg, become a household name. From the start MacKenzie was a favorite of judge Harry Connick Jr. After all, they share a birthday. MacKenzie sang his way to the top four and into the hearts of Americans everywhere. Idol wasn’t MacKenzie’s first appearance on the silver screen. In 2012, he competed on The Voice. Clearly, the music world hasn’t heard the last of MacKenzie. In fact, at our latest peek, his single “Roses” has climbed to the top 5 on the iTunes singles chart. Louisiana’s new favorite son is going places. MacKenzie Bourg – Top 3 Revealed: “Hallelujah”If there’s a secret chord, MacKenzie Bourg would find it! Not only is this young man talented, but he’s generous and humble. And, he’s been gracious enough to allow us to share pictures of the his smile makeover publicly. We can’t think of a single post that generated more discussion and questions. 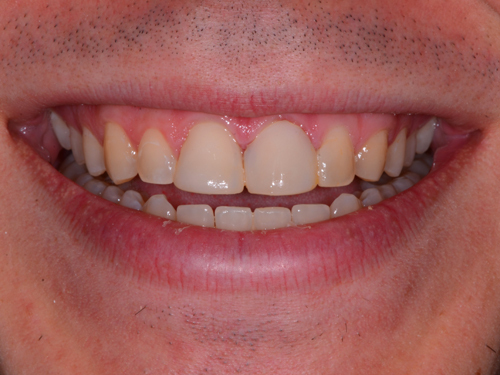 People wanted to know what procedures we performed to give him an even more gorgeous smile. 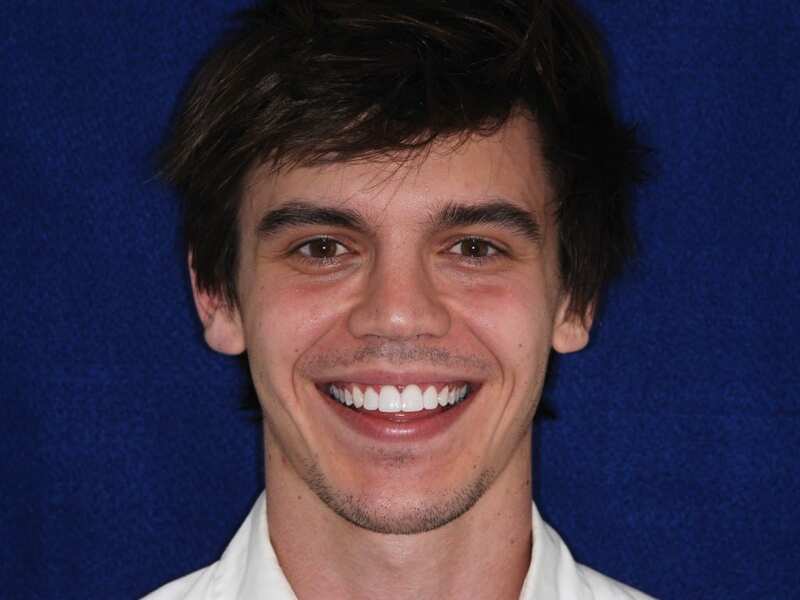 First and foremost, we recommended and performed a Zoom in-office teeth whitening procedure. 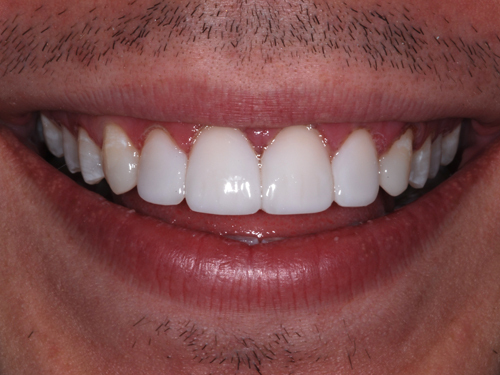 Then we removed old bonding work and replaced it with direct resin veneers on six of his front teeth. The finished product really brings out the personality that was already present in his smile. Someone Won Our iPad Air Holiday Giveaway! And the winner is…………..Jessica! Jessica won our iPad Air contest. Thank you to everyone who entered and be sure to enter our next contest! Happy Holidays! Powered by Infinity Dental Web. Mike Malone DDS & Associates would like to extend a congratulations to our long-time patient Kristen Girault for placing in the top 10 in the Miss USA pageant in Las Vegas! Dr. Malone has been the official Cosmetic Dentist of the Miss Louisiana USA and Miss Louisiana Teen USA pageants for quite some time. But Kristen is the first Miss Louisiana to place in the Miss USA pageant since 1996 when Ali Laundry won the contest. Congratulations, Kristen! A Metairie native, Kristen has been competing in beauty pageants for years. She was a first runner-up in the Miss Louisiana Teen USA in 2009 and 2010. In 2012, Kristen placed in the top 10 of Miss Louisiana USA. Finally on October 27, 2012, Kristen was crowned Miss Louisiana 2013 at the annual pageant right here in Lafayette, Louisiana. After winning the pageant last October, Kristen took time off from school and traveled around the state and country as a representative of Louisiana. Then on June 16th, Kristen was featured in the live telecast of the Miss USA pageant at the Theatre of the Performing Arts in Las Vegas. She made the first cut and earned a spot among the final 15 contestants; after the swimsuit competition round she made another cut to make it to the top 10! Now, Kristen is looking forward to returning to LSU in the fall to continue her Nursing degree. We are honored here at Mike Malone DDS & Associates to have contributed to Kristen’s success. Just goes to show how a bright, white smile goes a long way — especially if you’re in the spotlight like Kristen! Someone Won Our iPad Giveaway! Congratulations to our patient Tara Yergeau for winning our Spring into Summer iPad Giveaway! Tara was thrilled when we called her on the phone with the exciting news, and she came into our office yesterday to pick up her Apple prize. 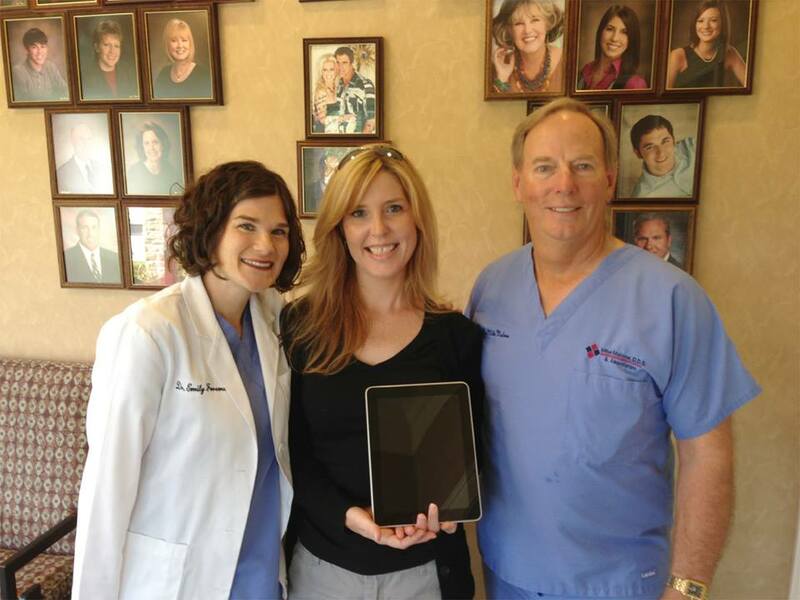 We took a celebratory photo of Tara with her new iPad; above she is pictured with Dr. Foreman on the left and Dr. Malone on the right. 1) How long have you been a patient of Dr. Malone’s? 2) What’s your favorite part of coming in to the office? 3) What was your first reaction when you found out you won the iPad? Amazed…I never win anything. I feel so fortunate to have received such a cool prize. I immediately started thinking about how and when I would use the iPad. We hope you enjoy hours of fun on your new iPad Tara! We also want to thank all of our patients and friends who entered and subscribed to our blog. Remember, you could be the winner of our next contest! We’re Giving Away An iPad! Wish you had an iPad for lounging around the pool and beach all summer? Well, guess what? We’re giving one away! To enter to win the iPad, all you have to do is like our Facebook page and agree to subscribe to this blog! ENTER HERE. It takes less than one minute! Our staff is particularly psyched this warm April Friday — we’re throwing a crawfish boil! Our fellow Louisianans know exactly what this celebration entails. For those unfamiliar with the tradition, a Crawfish Boil is an age-old tradition in the Deep South. Here in Louisiana, we celebrate with an outdoor party and feast on the delicious crustacean. Because we’ve just entered what we call ‘crawfish season,’ this time of year the Crawfish Boils are plentiful. This tradition is so indoctrinated into Louisiana culture that we have a few world-famous crawfish boils on a grand scale. These are the Breaux Bridge Crawfish Festival and Tulane University’s ‘Crawfest,’ both of which are heavily attended by Gulf-coast residents where the seafood is literally right out of the water. Though the big festivals are accompanied by jazz brass bands and 18,000 pounds of crawfish, we won’t be requiring that much food to feed our small team here at Malone Dental! So where did this crazy Louisiana tradition come from? It’s part of the Cajun culture, originating from the French-Canadian pioneers who in the 1700s were exiled from Nova Scotia by the British. The local Indians had already consumed crawfish before the Cajuns arrived. Back then, the Native Americans used reed sticks with venison as bait on the end. In the 1930s the net was introduced as means of capturing large amounts of crawfish; by the 1950s we had the modern crawfish trap. Crawfish (also called crayfish) are in fact descendants of the Maine lobster, but smaller and with their own unique flavor. They’re also called ‘mudbugs’ because they live in the mud of the freshwater bayous. Locals who hold crawfish boils at their homes often go out to catch their own in the bayous or crawfish farms instead of buying from fisherman. In fact, Lousianians are so serious about crayfish that in 1983 the governor signed a law designating the crawfish as the state crustacean, making Louisiana the first state to do so. Craving some crawfish but don’t live in the deep south? The rest of the country imports their crawfish primarily from Louisiana, so you should be able to find some wherever you are! Here’s a great overview on How to Throw A Crawfish Boil. Happy eating! Mike Malone DDS & Associates would like to congratulate the winner of our Sony HDTV Holiday Sweepstakes…….AMAR LANCON!!! Amar won a 32-inch Sony HDTV for him and his family just in time for Christmas. All he had to do was like us on Facebook and subscribe to this blog. Congratulations, Amar… we hope you and your family enjoy your new TV! Thank you to everyone who entered our sweepstakes. We will be having contests like this one all throughout 2013 so check out our Facebook page often for updates. Merry Christmas and Happy New Year to everyone. We hope your holiday is special!